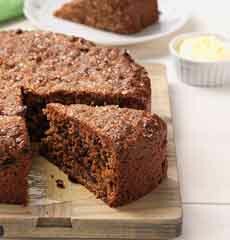  Brack, an Irish tea bread, is traditionally round (photo courtesy King Arthur Flour). But it can be a rectangular loaf (photo courtesy Stasty). 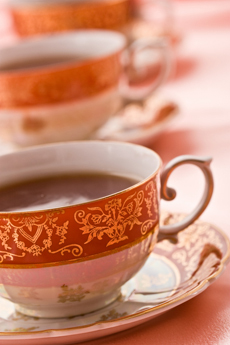 Enjoy it with a cup of tea (photo AG Photographer | Canstock). 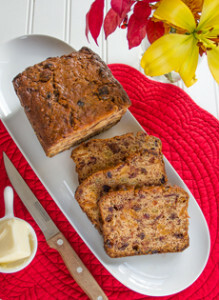 Brack is short for barmbrack, a traditional Irish sweet bread. The original barmbrack was a yeast bread with raisins and sultanas. Barm is a type of yeast and brack is a loaf of bread. Call it brack for short. In Ireland it is sometimes called bairín breac, Gaelic for “speckled loaf.” The speckling refers to the raisins and sultanas in the bread. That’s why it’s also called Irish Freckle Bread, a name which may go over better with kids and uncurious eaters. Call it what you will, today’s brack has ditched the yeast to become a moist, dense, packed-with-fruit breakfast and snack bread. It’s usually made in flattened rounds, but a loaf pan will do (and is easier to slice, in our opinion). It’s moderately sweet, like a zucchini bread or a raisin muffin. It is typically served with breakfast and afternoon tea; hence, tea brack. Some people like it toasted with butter. Barmbrack has also evolved into an Irish Halloween tradition. The Halloween version has fortune-telling trinkets hidden in the bread. This recipe comes from the award-winning cookbook, The King Arthur Flour Baker’s Companion. It uses brewed tea as its liquid. You can substitute 2 tablespoons of Irish whiskey for 2 tablespoons of the tea. Prep time is 10-15 minutes, bake time is 60-70 minutes. Cut to modest size, you can get 16 servings from an 8″ round cake. Serve it with a cup of tea, of course; and with softened butter if desired. 1. POUR the hot tea over the dried fruits in a medium-sized bowl. Set the mixture aside to cool to lukewarm, about 1 hour. 2. PREHEAT the oven to 325°F. Lightly grease an 8″ x 2″ round cake pan. If your pan isn’t at least 2″ deep, use a 9″ round pan. 3. STIR together the brown sugar, flour, baking powder and salt in a medium-sized bowl. Add the dried fruit and any remaining liquid. Stir until thoroughly combined. The batter will be thick and stiff. 4. ADD the egg, mixing till thoroughly combined. Spread the mixture into the pan. Sprinkle the top evenly with the coarse sparkling sugar. Bake for 60 to 70 minutes, until a cake tester inserted into the center comes out moist, but without clinging crumbs. 5. REMOVE the bread from the oven and turn it out of the pan onto a rack to cool.